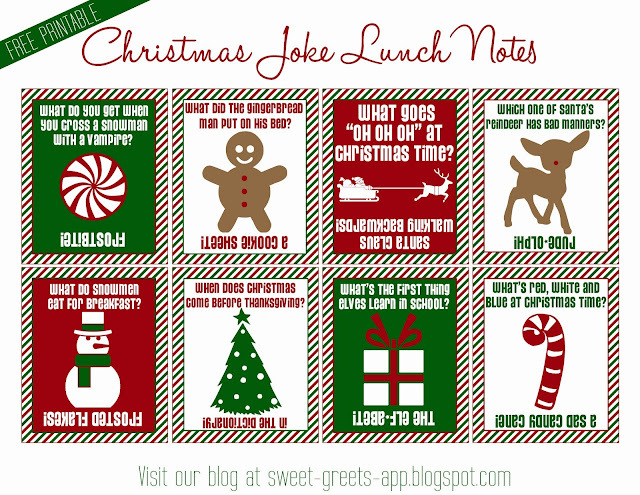 Here's a free set printable Christmas lunch notes for you. They feature silly holiday-themed jokes that will hopefully keep your kid and his or her pals entertained at lunchtime. Just click the image above to download. Enjoy! Thanks for stopping by! I just stopped by your blog and posted in the link party. Thanks for the invitation! I just "discovered" link parties recently and am so inspired by all the amazing things people create and share. By the way, I pinned your salt dough ornament post. I think it will be a fun holiday project for my son and I. Thank you for sharing these. Our elf is going to deliver them. So wonderful of you to share, thank you so much! I appreciate your gift and my boys will too!